How many turtles can you fit on a rock? Amazon Web Service (AWS) Certifications are industry-recognised validations of expertise and technical skills, rewarding the credentials that you need to advance in the world of AWS services. As more companies begin to integrate cloud-based solutions into their day-to-day workings, the demand for those competent in cloud computing increases. 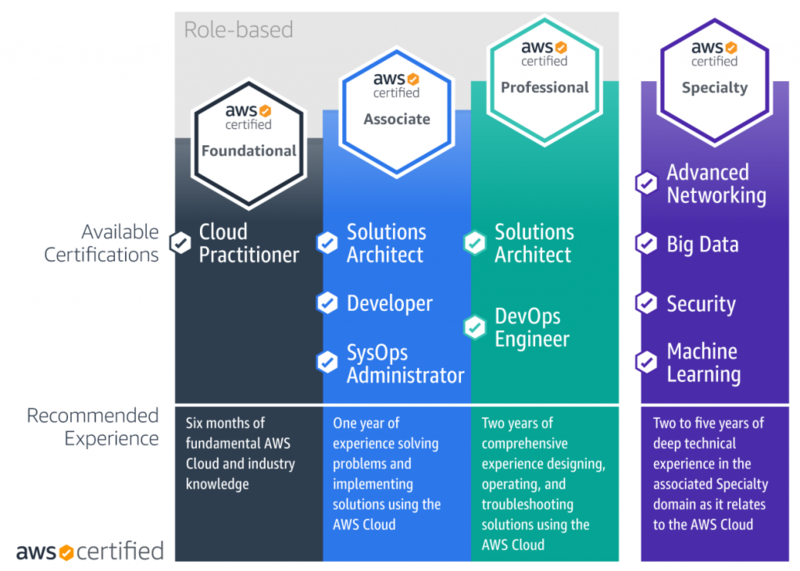 To enter into this ever-growing line of work, you’ll need to show that you possess the ability to manage, design, and deploy cloud-based applications, which is what an AWS Certification does for you. AWS’ certifications clearly demonstrate what skills you obtain and subsequently possess through their clear-cut learning paths. The AWS certifications begin with its Foundation certification, followed by a choice of three Associate certifications, and two final Professional certifications. If you further wish to demonstrate your technical skills and have them validated by AWS, you can do one of the three Specialty courses. Amazon Web Services is recognised as an industry leader, with their AWS Certifications being trusted and valid indications that you are fully skilled in the areas denoted by the certification. AWS is also the majority provider of public cloud applications for small and medium-sized businesses as well as enterprises, and as they continue to grow, the demand for AWS-certified professionals will grow. Through the use of AWS training and course materials, you can prepare for the certification exams, of which there are nine available in total: one Practitioner, three Associate, two Professional, and three Specialty. Here, we’re going to break down each of the AWS Certifications that you can enrol in, study, and earn a certification for, to prove your skills and understanding of AWS. By going to AWS Amazon, you can begin your journey towards AWS certification. The AWS Certified Cloud Practitioner is effectively the programme’s foundation course. It is used by people who wish to demonstrate their understanding of the AWS Cloud and have the skills to use it effectively. It is independent of Associate or Professional courses but works as a good base for those looking to move along the learning path and is recommended to those who want to go all the way to achieving certification in a Specialty. Being AWS Cloud Practitioner certified enhances your professional credibility. The AWS Certified Solutions Architect – Associate course is designed to validate the skills of those who intend to take on a solutions architect role. Earning the certification demonstrates that you know how to architect and that you can deploy robust and secure applications on Amazon Web Services technologies. Being AWS Solutions Architects – Associate certified validates your ability to use architectural design principles to create a solution for the customer’s requirements and use the best practices to provide implementation guidance over the course of the project. The AWS Certified Developer – Associate course has been created for those with one year or more of experience in developing and maintaining Amazon Web Services-based applications and seek validation of their ability in a developer role. The certification shows that you understand core AWS services, the best practices of basic architecture, and the uses of AWS as well as being able to debug, deploy, and develop cloud-based applications. The AWS Certified SysOps Administrator – Associate course has been designed for those who already have a couple of years of experience in a systems operations role as an administrator. The certification validates your ability to select appropriate AWS services, identify operational cost control mechanisms, operate and manage systems on AWS, identify the appropriate use of the best practices for AWS operations, and migrate workloads from on the premises to AWS. It is advised that you have strong general IT knowledge, hands-on experience and knowledge of managing systems on AWS as well as an understanding of security concepts. The AWS Certified Solutions Architect – Professional is a more advanced certification of the Associate version, demonstrating your extended experience and advanced skills in creating designs for applications and systems on the Amazon Web Services platform. After completing the AWS Certified Solutions Architect – Associate course and earning over two years of experience in the field, this Professional certification marks the next step. The AWS Certified DevOps Engineer – Professional is recommended for those looking to demonstrate that they have enhanced their skills and experience having earned the AWS Certified SysOps Administrator – Associate certification. Like the other Professional certification, it is advised that you compile a couple more years of hands-on experience in the profession following the Associate certification before attempting to earn this one. The AWS Certified Security – Specialty course is one of three AWS Specialty courses which demonstrate the vast knowledge of experienced professionals. For all Specialty certifications, it is recommended that you accumulate two to five years of deep technical experience in the AWS Cloud-related domain of the course’s subject. The Security Specialty focuses on your ability to deploy security on the AWS platform. The AWS Certified Big Data –Specialty validates your ability to design and maintain Big Data, implement Amazon Web Services Big Data using the best practices of basic architecture, and automate data analysis through the use of leveraging tools. The course and examination are best suited to those who can perform complex Big Data analyses and have experience in designing and implementing such programs through AWS services. It is recommended that you are certified in Cloud Practitioner or to an Associate level for this certification course. The AWS Certified Advanced Networking – Specialty certification is a validation of your expertise when it comes to designing and implementing hybrid IT architectures and AWS. It has been made for those who can perform complex networking tasks, which includes implementing core AWS services, deploying cloud-based solutions through the use of AWS, automating AWS networking tasks, and designing and maintaining AWS service network architecture. It is recommended that for this certification course, you already have an Associate certification or are Cloud Practitioner certified. AWS offers nine clear-cut certifications to validate you and your skills and are well worth earning to help you stand-out as a professional.